In recent years I have heard Steve Ray recall fondly how his father would read books to him each night. In addition, last year I remember Raymond Arroyo talking about his books and the importance of engaging children’s minds in stories that are not only full of adventure but are also wholesome tales. Honestly today as an adult I still find myself drawn to stories containing excitement, mystery, and discovery. Somehow these type of books transports me back to my youth among the stacks at my school library. If I close my eyes and think for a moment I can almost smell the books and hear the turning of pages as a new expedition unfolds. Oh, the memories! As a father, are you tired of trying to find books that are safe for your children to read? Are you searching for a book that you can read with your children, a book that entails boys heading out into the wild to investigate a mystery while growing in friendship? 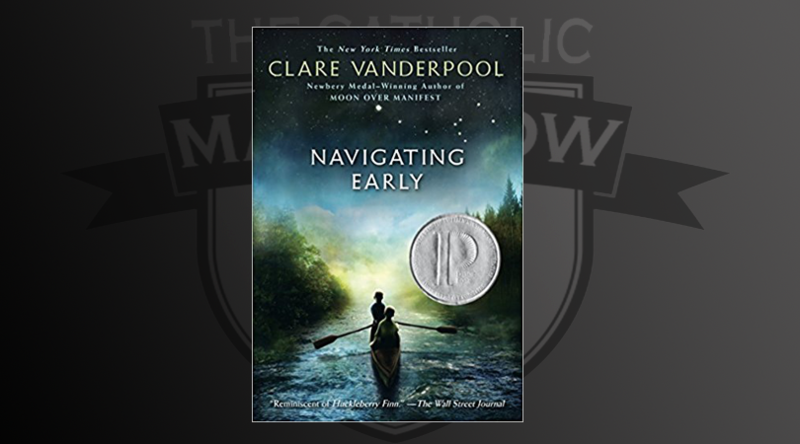 Well, might I so humbly suggest the book by Catholic author Clare Vanderpool titled Navigating Early? This story is full of action and adventure and does an excellent job of keeping your attention. In all fairness, I should warn you that the story might tempt you to want to go hiking, camping, or canoeing, so time your reading carefully and maybe budget some money for collecting outdoor gear as you head out to places unknown. Although my children are probably too old for me to sit and read with them, this tale still offers the chance for discussion with your children after they finish the book. This past summer my teenage son read this book, and now we have an opportunity to discuss this story on our drives to school and church activities. Yes, it is refreshing as a dad to have something to talk about with your teenagers that might involve more than a one-word answer! As the fresh air of fall descends upon us, consider giving this book a try. Maybe this story will allow you to reconnect again, not only with your children but also with the childlike sense of wonder and exploration we all still have. Perhaps you might just discover something new about yourself and more importantly, reap the benefits of spending more time with your children. P.S. Clare Vanderpool also wrote Moon Over Manifest. That book won the Newbery Medal and is also worth a read.